We have UK shows coming up, but they aren't open to the public. Watch this space for more dates. 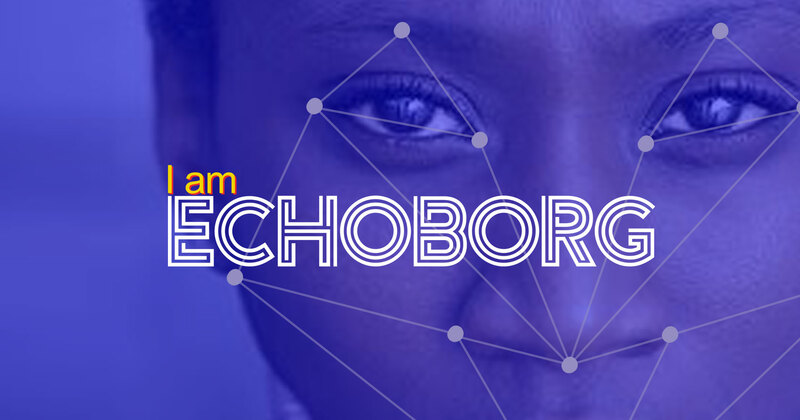 I am Echoborg at ACCU, Bristol. I am Echoborg at SWCTN, Plymouth. 22nd March 2019 Performance PRSC The Space, Bristol. 20th & 21st March 2019 Scratch Performances UWE, Arnolfini / Frenchay, Bristol. 3rd & 4th October 2018 Performances Future of Storytelling Summit, New York. 20th September 2018 Scratch Performances UWE, Arnolfini, Bristol. 29th & 30th June 2018 Performances The Cube, Bristol. 21st & 22nd June 2018 Scratch Performances UWE, Arnolfini, Bristol. 25th May 2018 Scratch Performance Pervasive Media Studio, Bristol. 24th May 2018 Scratch Performance UWE, Frenchay Campus, Bristol. 21st July 2017 Scratch Performance UWE, Arnolfini, Bristol. 19th July 2017 Scratch Performance Pervasive Media Studio, Bristol. 30th June 2017 Demo UWE Research Showcase, MSHED, Bristol. 20th January 2017 Performance Automation Anxiety Workshop, Digital Humanities Lab, Sussex University. 12th January 2017 Scratch Performance Pervasive Media Studio, Bristol. 1st December 2016 Scratch Performance Bristol Green House Studio. 5th & 6th November 2016 Performances State Festival. State of Emotion - The Sentimental Machine, Kuhlhaus, Berlin. 24th February 2016 Scratch Performance Pervasive Media Studio, Bristol.